I remember, while I was getting ready to go to school, before my teen years, my mom or dad would prepare my lunch bag. It would be the usual 2 slices of bread with butter and either cold cuts, cheese or something spreadable like, peanut butter or jelly (or both) or my favorite Nutella. Towards the 5th of December, when we celebrate St. Nicholas (Sinterklaas in Dutch), I would find something crunchy in my sandwich; speculaas. It’s a typical Dutch spiced shortcrust biscuit made with speculaas herbs like; cinnamon, nutmeg, cloves, ginger powder, cardamom en white pepper. Different variations are possible like anise, coriander and mace. Internationally, these cookies are also known as windmill cookies, caramel cookies or speculoos (Belgium). Usually it has an image of a Windmill or St. Nicholas figurine stamped on it before they are baked. In the US you can find the speculoos cookies by ‘Biscoff’. People are debating wether the cookie was invented by the Dutch or the Belgians. To me it’s a clear cut case, as the Dutch started the spice trade to get all these spices in the 16th century. One of the well known Indo Dutch cakes derived from these spices is our beloved ‘spekkoek’. Who would have thought that in the 21st century people would line up to buy the now world famous speculaas cookie spread (or butter)? The sugary, smooth and spicy cookie spread in a jar started it’s career in Belgium around 2007. The original recipe however, is from a Dutch woman a.k.a. Grandma Wapsie, who published her speculaas paste recipe on her website, back in 2002. “When I was a child, just after World War II, we were poor. On St. Nicholas Day my mother was always home making her cookie cake. 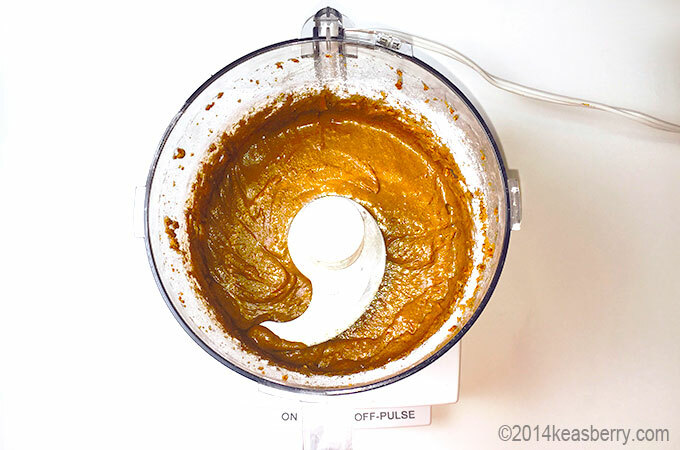 She made a cookie paste by crumbling speculaas cookies using a bottle, then adding butter. It was simple: we had cookie cake with a glass of chocolate milk ;” said Grandma Wapsie. In 2007, years later a famous Belgian cookie factory tried to claim the patent and prohibit other factories from making it. Unfortunately for them, a judge decided to nullify the patent, as it turned out a woman in the Netherlands a.k.a. Grandma Wapsie from Holland was the first one to publicize a recipe online since 2002. I think she deserves a piece of the pie. All she received, I read, was a couple of jars and cookies. 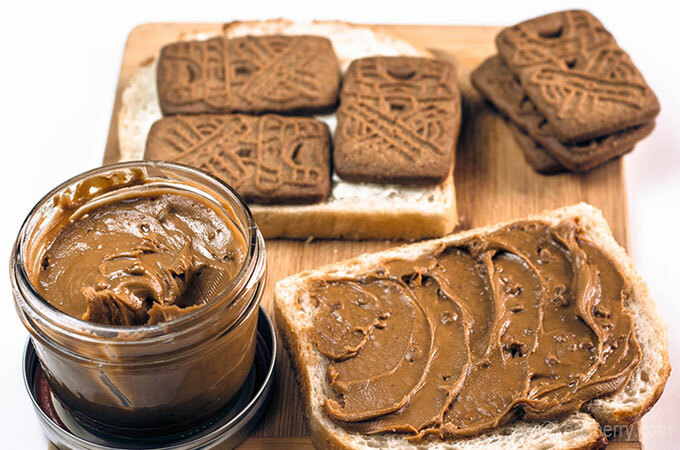 Speculoos Paste – the new Nutella? Speculoos Paste took America by storm around 2012. I remember going to TJ’s and the shelves were empty and they were on back order for nearly 2 weeks. What to do? What to do? It was back to putting speculaas cookies on my bread. So, just to be safe I learned to make my own. And if there’s no bread I just use a spoon! There are several recipes to make a paste of your cookies. Some have milk in it, the original one had coffee and milk in it. Remember what can happen when you dunk a cookie in some coffee…? Yes, a piece breaks off and sinks to the bottom of the cup. You can either fish it out or wait till you finish your coffee and then spoon out the cookie mud at the end. Instead of dunking the cookie in the coffee, we add some coffee with milk to some finely grinded cookies. I call it the reverse cookie drop effect. To get the desired consistency close to the one you get in the jar at the store, add some peanuts to it. The recipe below is with coconut oil and powdered sugar. Now let’s make some. Don’t start eating the cookies. 1. 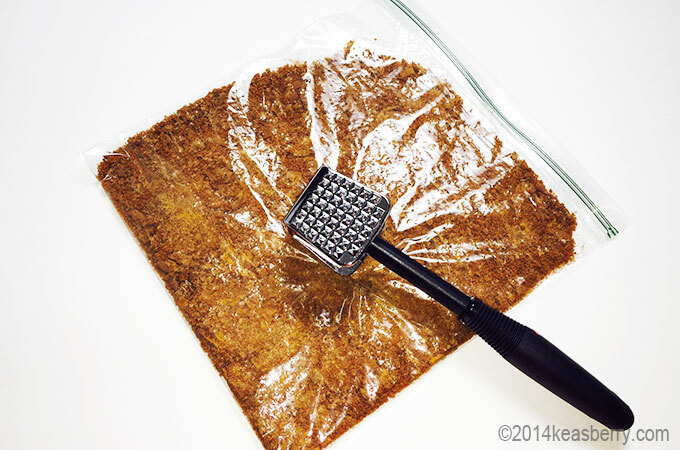 Do the cookies in a zip-locked plastic bag and crush it with a blunt object – I used a meat tenderizer. If you want it more crunchy, then do not process too long. Use brown sugar and cinnamon to taste. Add some coffee liqueur. To get a more peanut buttery consistency, add some peanuts to it.Onze verontschuldigingen, dit bericht is alleen beschikbaar in English.